A&W Restaurant welcomes you to their establishment. This dining room features a fast food menu and hamburgers for less than $10. They are conveniently reachable by car. Located at 518-2331 66th Street NW in Edmonton, Alberta, A&W is a company part of the foods - ready to serve category of Canpages website. You can call 780-450-9814 to get in touch with A&W that is in your neighbourhood. Satisfy your burger cravings at A&W, because their popular Teen Burger deal is back and you can get one for just $3.50! 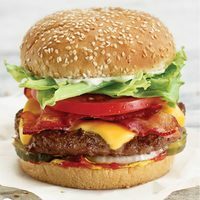 Perfect for lunch, dinner or a snack, the delicious Teen Burger is made with a 100% beef patty, lettuce, tomato, bacon, pickles, onions, cheddar cheese and A&W's signature Teen sauce, served on a toasted sesame seed bun. This deal is available until May 5 at all participating A&W locations -- click here to find the A&W restaurant nearest you.